The production of large amount of compounds is the characterization of modern drug discovery. This huge libraries of compounds need to be examine in short periods of time. So, Computer aided drug design has came out as a method for developing candidate drug for treatment of many disease types. The discovery of drug and developing new drug is a very long term process and very costly, that is why CADD approach is used in pharmaceutical companies to resolve this issue to some extent. It is a computational approach to discover developed, enhances and analyze drug and biologically related active compounds. This approach is used for virtual screening, virtual library design, lead optimization and also used for quick evaluation of large compound to guide and speed up the development of new active biological compound. CADD approach helps to define interaction between ligand and target. It is differing from high throughput screening (HTS) because it uses more targeted search. Structure based CADD: – The principle of structure based CADD are similar to HTS, in both structure of target protein and ligand are important. It design molecule/drug according to target protein structure and structure of target protein must be known. The goal of structure based CADD is to design compound that bind tightly to the target protein that is with low free energy, improved ADMET (absorption, distribution, metabolism, excretion, and toxicity) properties and are target specific. Ligand based CADD: – Ligand based CADD is used when receptor is not known. 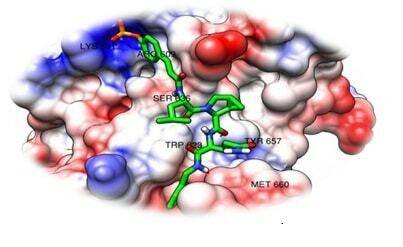 It tries to identify the properties which common to the known ligands to use in discovery for new or improved drugs. if a series of active ligand molecule is known for target protein, but little or no structural information exist for target protein then this method can be applied. There are two method to do this a) quantitative structure activity relationship (QSAR) method and b) pharmacophore method. QSAR enables understanding of the influence of structural factors on biological activity, using the models and the understanding to construct compounds with improved and optimal biological profiles. It is a technique used to predict the activities/properties of given chemical compounds as a function of molecular substituent. Pharmacophore models represent the 3D structure of the chemical compounds functionalities that make a molecule active towards its target. These models are constructed either structure based or ligand based. Pharmacophore is a main tool in drug discovery. The use of pharmacophore models can predict unwanted side effect in very early stages of the drug-discovery process and therefore reduce the risk of late failure of drug candidates. The application of pharmacophore is lead optimization, multi-target drug design, and activity profiling and target identification. These approaches provide insight into how a drug molecule interacts with their molecular target. Many pharmaceutical companies now use these approaches and bioinformatics tools to reduce cost burden because cost of drug discovery and development of new drug has reached $800 million for each drug successfully brought to market. It provides a deep understanding to drug-receptor interaction acquired by the researchers. The CADD approach plays a vital role in the search and optimization of potential lead compounds with a considerable gain in time and cost. 1)chun Meng Song, Shen Jean Lim, Joo Chaun Tong. 2009. Briefing in bioinformatics. Recent advances in computer aided drug design. 2)Odilia Osakwe. 2016. Elsevier. The Significance of Discovery Screening and Structure Optimization Studies. 4)Sheng Yong Yang. 2010. Elsevier. Pharmacophore modelling and application in drug discovery: challenges and recent advances.